Houghton 75 > Artworks > Open House 75: Houghton Library Staff Select > Arthur A. Houghton, Jr.
Houghton Library is named for Arthur A. Houghton, Jr, Harvard Class of 1929. As a junior and already an enthusiastic book-collector, Houghton enrolled in class Fine Arts 5e,The History of the Book, taught by librarian George Parker Winship, who inspired a generation of Harvard and Radcliffe bibliophiles. In time Houghton entered into the first ranks of American collectors, while holding senior positions in the family-held Corning Glass Company and Steuben Glass – and not, as is commonly assumed, in the Houghton Mifflin publishing firm, whose records are held by this library. In 1938 Houghton, a newly-elected member of Harvard Library’s Visiting Committee, expressed his intention of funding the building of a new library to house the university’s rare book and manuscript treasures as well as his gift of an unrivalled collection of material on the English Romantic poet John Keats. He recommended William Graves Perry of the architectural firm Perry, Hepburn, and Shaw to design the library – the first free-standing general special collections library at an American university. Not evident from its Neo-Georgian style exterior were noteworthy design features such as state-of-the-art air handling and insulation, adjustable triple-baked enamel shelving, innovative exhibition case lighting, and a bridge connecting Houghton to Widener Library (demolished in 2004). As the library’s collections grew in size, so did the need for space to shelve them: the construction of neighboring Lamont Library in 1948, Pusey Library in 1977, as well as the off-site Harvard Depository in 1986, provided additional stack space for Houghton’s use. 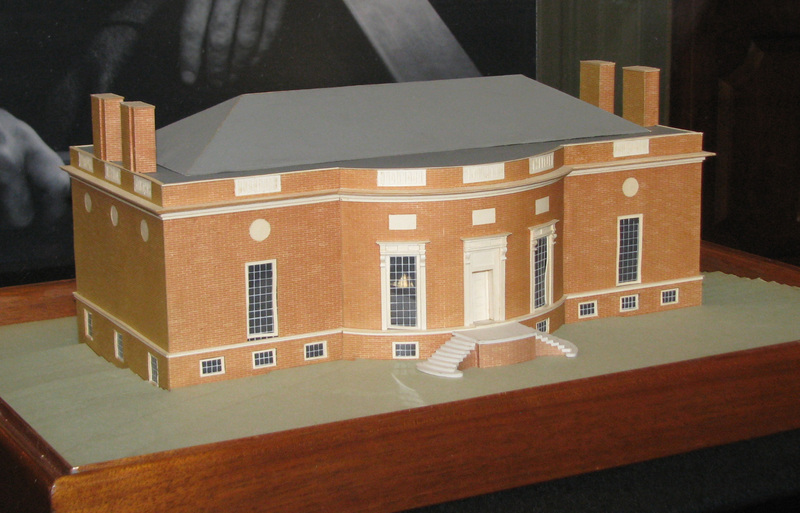 Brooks, an affiliate of the Harvard Graduate School of Design, created this scale model of the library for presentation to its founder Arthur A. Houghton, Jr. in 1951. Your ticket for the: Arthur A. Houghton, Jr.